This year we celebrate the 80th anniversary of the founding of the Eastern American Diocese by the ever-memorable Archbishop Vitaly (Maximenko) in 1934. This anniversary gives us reason to stop and assess the 80-year path that has passed before us, while making provisions for a brighter future. The Lord has been merciful to us sinners, and has blessed our Diocese with peace and prosperity throughout its history. It is a history that has been intertwined with the catastrophic events of the 20th century, which left our Russian homeland and most of Europe in ruins after decades of war and revolution. As we celebrate the past eighty years, our joy is bittersweet because we cannot ignore the events that have been transpiring around us in the world. The moral and political landscape of the world is rapidly changing for the worse; it is once more a hostile time for Christians. Our youth are facing trials of temptations that breed sinister spiritual despair. When we think about what the next 80 years might bring, we must be prepared to stand firm in our faith against a world that will war against us as it wars against Christ and His Church. Founding of the Eastern American Diocese For this reason, Christ our Savior warned his followers: “If ye were of the world, the world would love his own: but because ye are not of the world, but I have chosen you out of the world, therefore the world hateth you” (John 15:19 ). Christ also comforted them, saying: “In the world ye shall have tribulation: but be of good cheer; I have overcome the world” (John 16:33 ). In order to heed the words of our Savior, our vision for the future must be built upon the rock-solid spiritual foundation laid out for our diocese by Archbishop Vitaly, all the First Hierarchs of the Church Abroad, and other pillars of Orthodoxy, such as Archbishops Nikon (Rklitsky), Averky (Taushev), Andrei (Rymarenko), and the countless priests, monks, and laymen who toiled alongside them over the past eight decades. They understood that words, regardless of how eloquent they may be, will not be enough to inherit the Kingdom of Heaven. They heeded the words of our Savior when He said, “Not every one that saith unto me, Lord, Lord, shall enter into the Kingdom of Heaven; but he doeth the will of my Father which is in Heaven”(Matthew 7:21). We call upon all of you to strengthen your prayers and continue expanding your involvement in the daily life of the Church. We have been blessed in the Eastern American Diocese with faithful, talented, and dedicated clergy, who have been appointed to their positions through the grace of the Holy Spirit to be the shepherds of all of the souls entrusted to them by God. While financial and physical contributions are important and necessary to the life of the parish, the highest priority of every Orthodox Christian must be to attain eternal salvation through the saving bosom of the Church. If our primary focus is the salvation of our souls, then all earthly concerns over finances and administration on both a parish and diocesan level will either resolve themselves or become clearer and easier to understand. Glory be to God, the past five years have been a period of steady growth in our Diocese, both in the administrative sphere and on a local level. Our parishes are growing, new clergy are being ordained, missionary efforts are being expanded, and our flock is now larger and more multifaceted than ever before. In an effort to keep up with the growing demands of operating our vast Diocese, we have blessed the creation of a new diocesan center at St Alexander Nevsky Cathedral in Howell, NJ. This decision came after much prayerful deliberation with members of the Diocesan Council and a full review of the specific needs of a potential diocesan center. The cathedral will officially become the episcopal See of the Ruling Bishop of the Eastern American Diocese and the administrative center of the Diocese on September 12, 2014. We believe that this vision for a new center is the fruitful vine, sprung from the seeds planted by our founder. 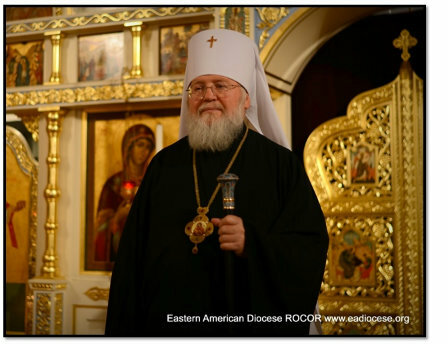 In all of his monastic wisdom, Archbishop Vitaly foresaw the bright future of Saint Alexander Nevsky Church and the important role that it would play in the strengthening of our Eastern American Diocese. Having founded this parish as his first in America, he said: “I pray God that this, my firstling, the parish of St Alexander Nevsky, might flourish as a tree planted at the waters.” Together, we must strive to fulfill the will and testament of our founder by building a center there that will serve not only the administrative needs of our Diocese, but most importantly – the spiritual needs of our faithful. The new center must act as a safe spiritual harbor for our clergy and faithful, where they can unite together in prayer and brotherly love, regardless of their ethnicity or language. To do this, we must cultivate within ourselves the chief virtue of every Christian—love. “By this shall all men know that ye are My disciples, if ye have love one to another,” said our Lord and Savior Jesus Christ (John 13:35 ). The triumph of Christ’s love over worldwide evil is the cause of our celebration during this 80th anniversary. In order to cultivate this love within our hearts, let us be mindful of the words of Saint Nektary of Optina, who said: “Pray that the Lord will rule in your heart. Then it will overflow with great rejoicing and happiness, and no kind of sorrow will have strength to disturb it.” This is how we are called to live and grow with Christ. This is how we must thank our Creator and celebrate all of the accomplishments of the past 80 years, and this is most assuredly the feeling that will rule our hearts when we gather together in our Diocesan Center to celebrate the Divine Liturgy. We invite all of you to come to St Alexander Nevsky Cathedral on November 14-15, 2014, to experience this feeling of Paschal joy as we gather to honor and thank our Lord for all that He has done for us. This celebration will strengthen our faith and remind us of the need for fortified spiritual vigil, a firm stand for the pure and unadulterated Faith, and devotion to the Truth of the Church, which holds this Faith sacrosanct in the face of worldwide apostasy. If we hold to these principles, the state of our Diocese will remain strong.